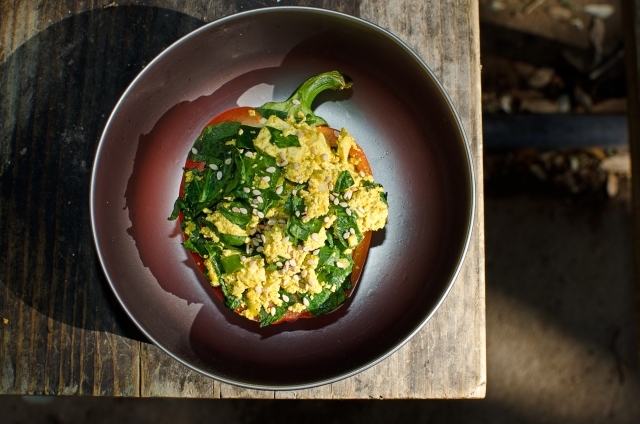 This recipe is our vegan adaptation of a BBQed Egg. In a large airtight container combine green onion, garlic powder, soy sauce, nutritional yeast, turmeric, and Cayenne pepper. Add tofu and spinach and mix until all ingredients are thoroughly incorporated then set aside. Fill the bell pepper halves with the tofu scramble and wrap with tin foil. Grill over charcoal until the peppers soften, about 10-15 minutes. Sprinkle with sesame seeds and serve hot.